The TwinScope is a unique stereoscope for viewing stereographs or other side-by-side 3D prints (with combined maximum width of 8 inches). 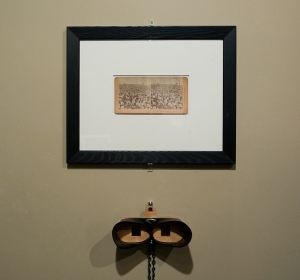 In designing the product, the aim was to replicate the viewing experience of the classic Holmes stereoscope, but in a museum-worthy hanging stereoscope for viewing stereographs that are not only hand-held, but also matted and framed, in exhibition cases, or otherwise displayed. Like the Holmes stereoscope, the TwinScope has a lens hood–in this case rubber, and large enough for eyeglass wearers–as well as prismatic lenses to give a clear, magnified view. A hanger incorporated into the wooden lens boards allows the TwinScope to hang on the wall or mount onto a pedestal. 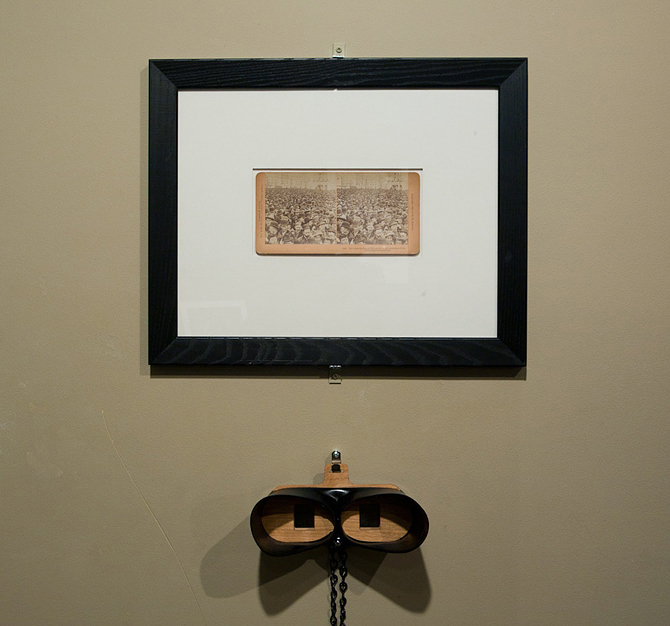 Focus is achieved by looking through the TwinScope and adjusting ones distance to the stereograph from 6-8 inches away. Additionally, when the TwinScope is turned upside-down, the hanger becomes a handle for hand-held viewing of loose stereographs (the handle will be lengthened thanks to feedback from a PSSCC member), offering a robust alternative to using fragile historic viewers. TwinScopes were first used in an exhibition produced on the history of the stereograph for the Onondaga Historical Association earlier this year (http://colleenwoolpert.com/Sight-Unseen) and have been purchased locally by the University of Washington Special Collections, the Henry Art Gallery, the Bainbridge Island Historical Museum…and by one PSSCC member at the December club meeting! For more information, or to purchase a TwinScope ($150 at this writing), contact Colleen Woolpert directly at @ or (315) 412-5890. 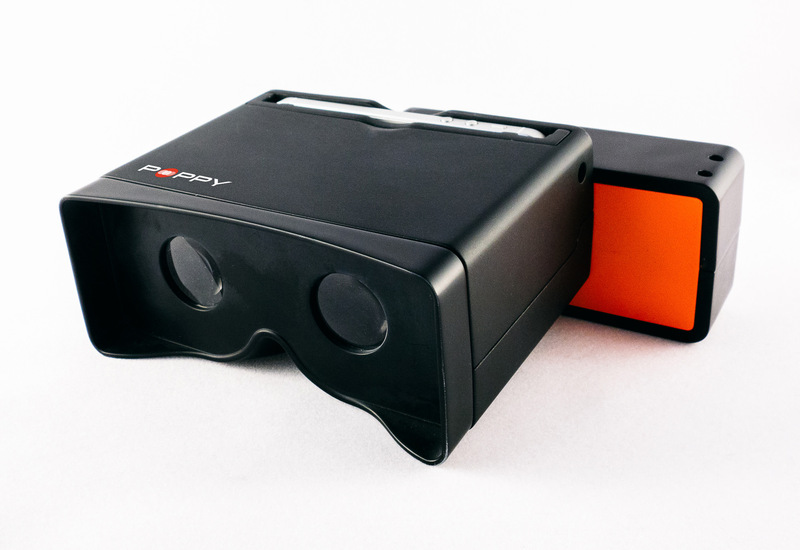 Poppy, a sleek and somewhat retro black and orange gizmo, transforms an iPhone into a camera capable of capturing, viewing and sharing photos and video in 3D. Put your phone in the device (which supports iPhone 4, 4S, 5 and iPod Touch) and give the box a twist to begin recording. So how does it work? Poppy uses mirrors to capture two stereographic images using the iPhone’s single camera. When seen through the viewfinder, Poppy’s lenses combine the two video streams into a single, crisp, 3D video. “As kids, we loved those old toy Viewmasters, and how they gave you the feeling of stepping into another world. We wanted to let anyone create and share their own immersive 3D scenes too. That’s why we made Poppy,” says Joe Heitzeberg, one of Poppy’s creators. Another great thing about Poppy is that it works with 3D content that’s already online. Most people aren’t aware, but YouTube supports 3D and has amassed a huge library of 3D movie trailers, music videos, sports clips and user-generated content — and all of it looks beautiful on Poppy. The viewing experience is immersive and natural — much higher fidelity than using red/blue 3D glasses. Poppy is launching on Kickstarter at under $50 — putting Poppy in the sweet spot for gifts and casual gadget purchases. It also sets Poppy apart from other 3D cameras that have come on the market in recent years, which are more expensive and don’t typically include 3D viewing or sharing functionality. “iPhone is the world’s most popular camera, and Poppy is the first product that lets the iPhone capture, view and share the world as it is actually experienced — in 3D. We can’t wait to get it in people’s hands and see what they do with it,” says Poppy co-creator, Ethan Lowry. Please check out Poppy on Kickstarter today.